Yoro Falls (養老の滝) is one of 100 best waterfalls and 100 best water in Japan. It is 32m high and 4 wide waterfalls located in Gifu prefecture. 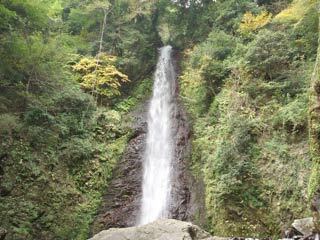 This waterfalls is located in Yoro Park which is popular spot in this area. Legend says, the water of this falls became Sake. There is two parking. Upper parking which 5 min from the fall requires 1000 yen. If you park at the parking of the park, it requires hard walking to the falls. During Nara Period, the Emperor Gensho declared that this water,springing from the depths of Mt. Yoro, would cure any disease. There are historical documents attributed to Emperor Gensho that quote that the water from Yoro Falls, when used to wash one's hands and face, would make one's skins smooth and clar, and any disease would disappear. He further insisted that lost hair would return, and that failing eyesight would be restored. He asserted that it was a veritable "fountain of youth." The year 717 marked the beginning of the Yoro Period. According to historical record, there was a natural spring located 500 meters beneath Yoro Falls bearing the same waters. A Shinto Shrine was built on the sight. The spring and the falls have somehow separated, although the spring remains.